You can now receive our weekday recommendations in an email at 7pm in the evening to give you a little advance notice of what’s on the following day. We've moved this from the earlybird 7am slot on the day in question in response to reader feedback — most recently from 'Moody', who told us how helpful it would be to receive Wednesday's list of things to do on Tuesday night as his son comes to stay and it would help him plan their day out together. Aw. We’ll still Tweet and Facebook the article in the morning and you’ll always find it at the top of the site at the start of the day. If you're late looking at the site, access it through the 'Today' menu item up top. Event organisers: want to see your event in these last-minute listings? 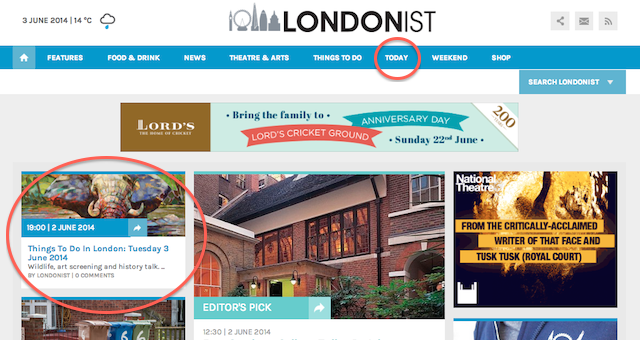 Email us at hello@londonist.com at least 48 hours before the event, and we will consider it for inclusion. Note, because of high volumes of email, we can’t always reply. Manage your subscriptions to all our email newsletters here.